Steel pipe pile structure of the high durability CB, not pure metal, multi-alloy containing C, iron as Si, Mn and other elements of the amount of alkali. Therefore, during the crystallization process, it is not a constant temperature (melting point), a specific temperature range to complete. The crystal begins to equilibrate under the conditions of the molten steel temperature time (TL) when the liquidus temperature is below the lower crystallinity and the crystal orientation is reached by ending the solidus temperature (TS). In order to measure the breakdown characteristics of the material to produce a predetermined permanent residual plastic deformation equal to a certain value, some metallic materials are difficult to measure, stress, known conditions (about 0.2% of original length), it brings a little bit of Is a very significant strength or brittle strength σ0.2. At the beginning of breaking the tensile treatment material, the maximum stress has been reached. This indicates the degree of resistance of the steel. Tensile strength and the corresponding compressive strength, bending strength and so on. Table 3-21 (1) Grade and chemical composition. Note: 12mm thicker than 1.09CuP of manganese content of 1.00% of the allowable upper limit value. 1. In order to improve the performance of steel, can add vanadium, titanium, and a variety of trace elements such as niobium and rare earth elements. The mechanical and technical characteristics of (2) are shown in Table 3-22. Note: The apex diameter, the thickness of steel 1.D. 2. Annealing and cold or hot rolling in the heat transfer, cold-rolled steel pipe pile foundation pit supporting the state after the steel, it must be annealed after birth. (3) the normal delivery state, in the use of the process, hot rolling, cold rolling high weather resistance and low alloy structural steel adaptive vehicles, including (coil) steel and part of the building, tower, Bolts, rivets and welded structures. The thickness of the steel welded structure must not generally be greater than 16 mm. 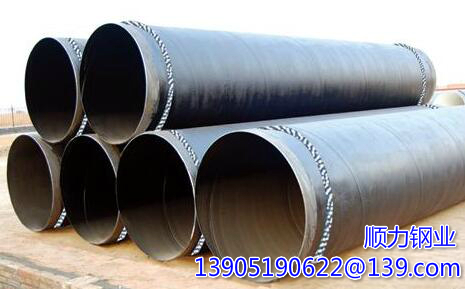 Jiangsu Shun of Steel Group production: spiral pipe, large diameter steel pipe, large diameter, thick-walled steel pipe, pile with the pile, please contact us.